Birds, Butterflies, Bats, and Bees…oh my!!! By the simple act of transferring pollen from one flower to another, one of the great miracles of the plant kingdom takes place and production of our food begins in earnest. Without pollinators, we don’t have food crops. 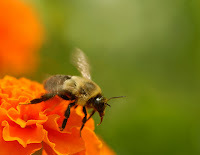 Something like 1 in 3 bites of food we eat are a direct result of pollinators doing their job. The relationship between pollinators and plants is critical to healthy cultivated and wild plant communities. But we are facing some critical problems that are negatively affecting pollinator populations. The loss of habitat, the increased use of pesticides and other chemicals, combined with unexplained diseases have imperiled these relationships. This is alarming news about what is happening to the pollinators. Even scientists don’t completely understand or agree about what is happening to pollinators. This can be daunting because it’s hard to determine a best course of action and what we can do individually and collectively to make positive change. Protect the pollinators from toxins. Every day we release pesticides and chemicals that poison or impair the breeding cycles of our pollinators. Become aware of the species native to your area and what needs to be done to insure their continued success. Read labels before you buy and spray - make sure that you minimize the impact on your local pollinators. Buy organic foods - support farmers who are not using pesticides and chemicals. Build habitat for native pollinators. Loss of habitat is one of the great dangers confronting pollinator populations. Pollinators need undisturbed habitat for nesting, roosting, and foraging. An important part of building habitat is to plant native trees, shrubs, fruits, vegetables, and ornamentals. Contact your local native plant society or the master gardeners in your area – they have lists of native plants that attract and support pollinators. Plant native in your garden. Focus on including nectar and host plants in your gardens. Work within your community to create large, uninterrupted areas of plant populations in which pollinators can live and work. Add a mason bee house or bumblebee habitat to your garden - these are natures gentle pollinators. It doesn’t seem like much, but if we all take one idea and turn it into action we will make a difference.